The Hero Realms: Journeys Kickstarter is in its final hours! It has tons of new content for Hero Realms, whether you’re playing it PVP or cooperatively. 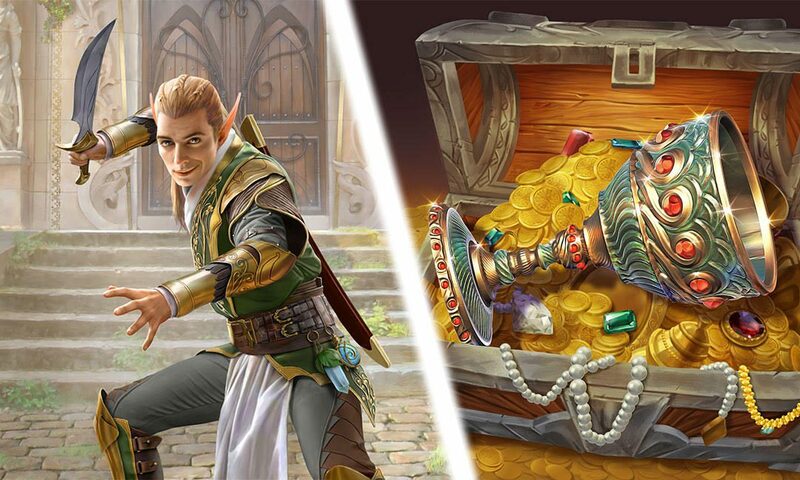 This is the next in a series of articles covering what is coming in Hero Realms! 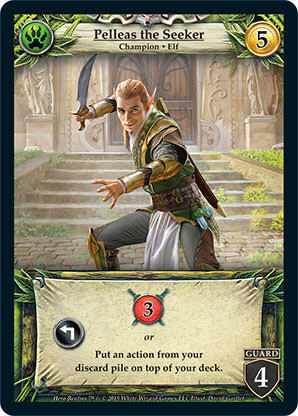 In our last preview article, we introduced the new Quest card type. Whenever you complete a Quest, as a reward you’ll get to acquire a special type of Item called a “Relic” for free (without paying its cost). 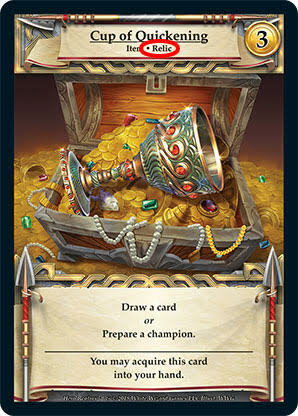 Some Relics have an ability that happens when you acquire it, such as putting into your hand or on top of your deck. This is so you can use your shiny new card shortly after completing your Quest. And some Relics have an ability that happens when it goes to your discard pile. This includes when you first acquire it and each time it goes to your discard pile on later turns. While it’s fun to complete Quests to earn Relics, if you don’t feel like playing with Quests you can shuffle your Relics directly into the Market deck during setup. In this case you’ll pay to acquire a Relic the same way you’d acquire any other card. 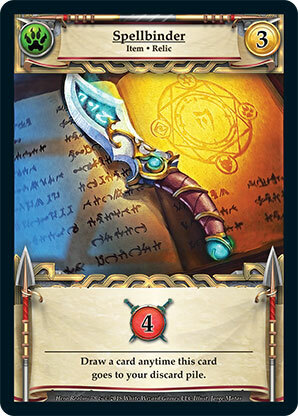 Speaking of Relics, we’d like to introduce you to Pelleas the Seeker. Pelleas loves to hunt for Relics. “If we come across any let’s be sure to ask.” There was no space left for Imbara’s Rod, so he tucked it into his belt. Satisfied, Pell slung the satchel across his chest. “Now then. Let’s have an adventure.” He entered the cavern, and Erren trudged after, muttering about pain and death. They walked in silence. Lanterns hung from the walls, but they had long burned out, and when the cavern narrowed into a low-ceilinged corridor, the darkness overpowered even their keen night vision. Erren lit his pathfinder’s staff and illuminated their steps. A stone slab shot out from the left wall at shoulder height just as a second slab shot out from the right. Pell flung himself down on top of Erren. The slabs slammed into each other right where their heads had been a moment before. The elves rolled onto their backs. As they caught their breath, the slabs slowly receded into the walls. They continued deeper into the caverns, managing to avoid three more trigger mechanisms hidden in the floor, before they arrived at a fork. “Which way?” Erren shined his staff down each direction. Pell retrieved the Stone of Seeking from his pack, squeezed it in his palm, and concentrated on their goal. He held the faintly glowing stone first toward one passage and then the other. Then again to be sure. Both times the stone grew brighter when he held it to the right. They reached another split, and another, and so on. The halls had become a maze. At each junction, Pell used the stone to keep them headed toward their prize. Here and there Erren scraped an arrow on a wall for the return journey. At last they came to circular room with no exit other than the way they’d entered. Twelve pedestals lined the curved walls, on each one crouched the statue of a lizard the size of a hunting dog. “There it is.” Pell pointed to a dais at the far end of the room. It was made of cut marble and stood as tall as a dwarf’s shoulders. On top lay a ring of crystals from which emanated a shimmering field of energy in the shape of a dome. And inside the dome was the Cup of Quickening. As they approached the dais, Erren eyed the lizard statues with some suspicion, but Pell was more interested in the large dust piles on the floor around each pedestal. They stared through the dome of energy. The cup seemed an ornate chalice made of gold and decorated with gems. But if the stories were true, it held other properties. Erren reached out a hand, mesmerized. “Don’t,” Pell snapped. “The field will take your fingers off.” He squatted and looked the dais over. It was covered in small rods and levers too numerous to count. “What do you think?” Erren leaned on his staff with both hands. “I don’t believe so. I think it’s just a lock. You either have the key or…” Pell’s nose twitched and he began to rummage through his pack. “Not a good idea,” Pell said absently. “Because I spent half my life with my face in a book. Ah, here it is.” Pell pulled a curved dagger from his pack. “Let’s find out.” Pell brought the tip of Spellbinder closer and the dome began to crackle. “Then we run?” He lifted Spellbinder with two hands, the blade pointed down. Pell brought Spellbinder down. The dome broke apart in a spray of sparks and just like that it was done. He heard Erren let out his breath. The dagger was unharmed and Pell returned it to his pack. He raised the Cup of Quickening. “Lighter than I thought,” Pell said to himself. “Pell.” Erren spoke with some urgency. “Pelleas!” Erren seized his brother’s shoulder and gestured about the room. All twelve statues were vibrating furiously, their stone coverings beginning to crack. “Oh.” He shoved the cup into his satchel and they ran. The statue by the entranceway burst apart revealing a green-gray lizard with a long snout and rows of short, pointed teeth. It clacked its jaws together a few times, then turned its head as the elves bolted past. They followed the first two arrows Erren had scratched into the walls, but around a bend they nearly smacked into a wall which barred their path. “That wasn’t here before!” Erren cried indignantly. “Well, it is now!” Pell dragged his brother down a new passage. The scrabbling sounds of the lizards came from behind them. They jogged as fast as they dared while keeping an eye out for traps. The corridor narrowed and Pell stopped short. “See those holes?” Several dozen fist-sized openings were cut into the walls, spaced at rough intervals and varying heights. A deep breath, then Pell took off. The elf flew down the corridor. A spear thrust out of each opening as he passed, but much too slow to touch him, and as he neared the end of the passage he found himself smiling. Until his boot caught on a loose rock. He stumbled and found himself airborne. A final spear hole waited next to where he was about to land face first, but he turned his fall into forward roll, and the spearhead pierced the air a hand’s-breadth underneath his tumble. Pell scrambled to his feet and watched Erren’s dash. His brother made great use of the safe period as the spears returned to their positions in the walls. Just as Erren reached him, Pell saw the first of the spitemaws appear at the far end of the corridor. It charged but a spear punched through its torso, and the impaled creature screamed in frustration. The elves raced through the caverns, trying to put distance between them and their pursuers. On open ground their superior footspeed would carry the day, but in the dark confines of the twisting maze, it was a losing battle. A lizard, faster than the rest, leapt onto Pell’s back. He braced himself for the bite, but Erren swung his staff and swatted the thing into a wall. Pell tugged the Web Jar from his satchel and flung its contents in the direction of the spitemaws. In a matter of seconds the corridor was jammed with a mass of spider webs. The scurrying lizards stuck fast. “I wasn’t sure that would work,” Pell said, grinning. A curtain of fire rose from the ground halfway between the elves and the exit. “Now what?” Erren turned to watch for the lizards, his staff gripped tight. “Venomous,” Pell said as he searched through his pack. “You’re not going to like it.” The lizards charged. Pell grabbed hold of his brother’s arm and started tugging him toward the wall of fire. Pell shoved with all his might, and Erren screamed as he stumbled through the flames. A lizard sank its teeth into Pell’s leg. Another leaped onto his shoulder and bit his neck. He felt nothing. He rolled to the ground and into the fire. The spitemaws burned. Pell came to rest on the other side, unharmed. “I wasn’t sure that would work.” Pell lay on his back and smiled up at his brother’s look of astonished outrage.